Cindy Wright is a highly talented Belgian artist best known for her dark and morbidly beautiful large-scale photorealistic paintings and drawings. Born in Herentals, Belgium in 1972, she graduated with a Master in the Visual Arts in Painting from the Royal Academy of Fine Arts – K.A.S.K.A. in Antwerp, and got a Postgraduate Laureate from The Higher Institute for Fine Arts also in Antwerp, in 2006. 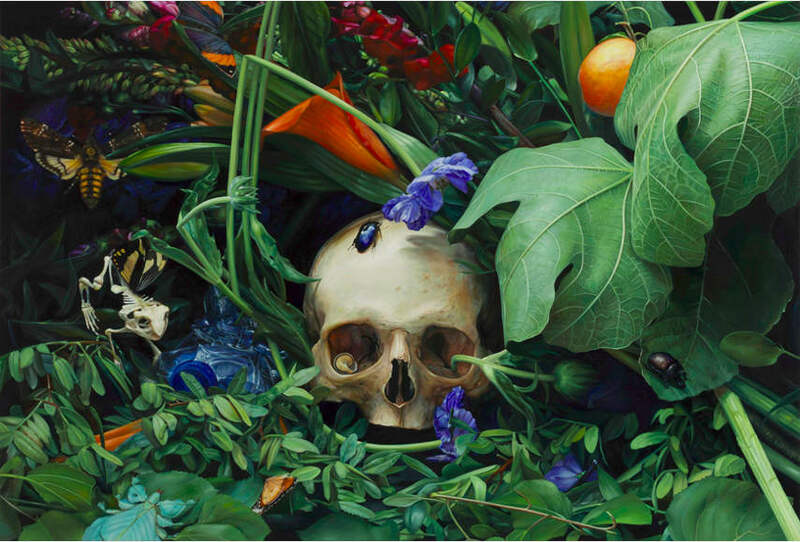 Cindy Wright works around the vanitas theme – a still-life painting of a 17th-century Dutch genre containing symbols of death or change as a reminder of their inevitability. 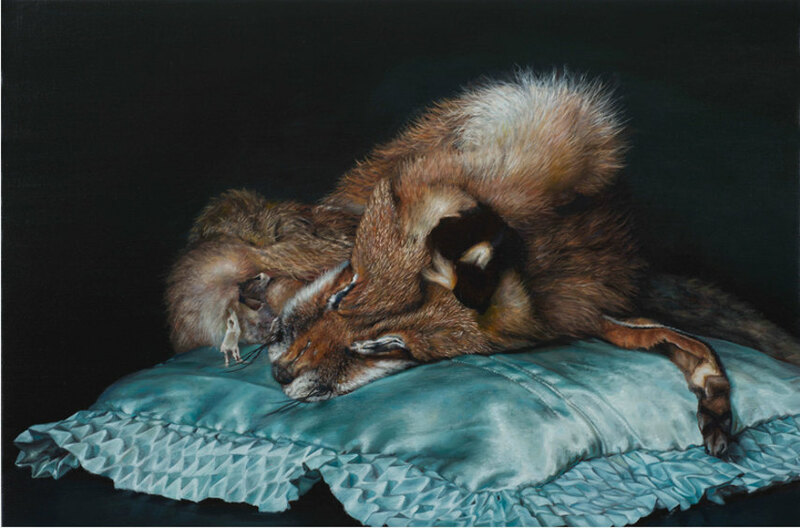 Influenced by the still life paintings of Dutch Baroque artists, her subjects include dark elements such as skulls and rotting meat, bees and fruit, butterflies emerging from their chrysalis. These symbols, used as a visual reminder to be prudent and grateful for all that life has to offer, portray an immediate reality of decline, life and death. As an end result in oil or charcoal, Cindy’s paintings and drawings at the same time display masterly painting technique and a sense of an essential understanding of the subject. Cindy Wright’s art has been exhibited widely, in numerous group and solo exhibitions in Belgium, and internationally in the United States, Netherlands, Germany and France. In 2014, she was included in a group show celebrating Belgian fashion designer Dries Van Noten’s inspiration at the Musee des Arts Decoratifs in Paris. 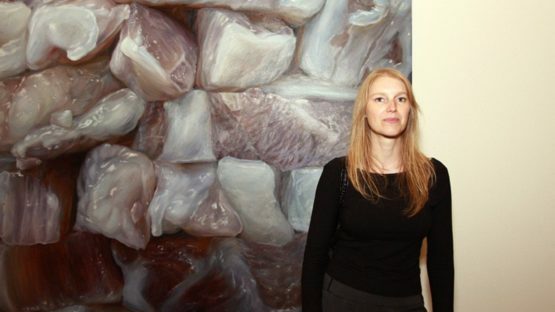 Her work is held in a private and public collections including The Frederick R. Weisman Art Foundation in Los Angeles, the Honolulu Museum of Art, the Las Vegas Art Museum, the Madison Museum of Contemporary Art in Madison, Wisconsin, the Museum of Contemporary Art San Diego, the National Portrait Gallery in London and the Royal Academy of Fine Arts in Antwerp, Belgium. Cindy Wright currently lives and works in Antwerp, Belgium.